It is with great sadness that we announce the passing of one of our beloved Sustaining Members, Caroline Ragsdale Reutter, after battling ovarian cancer. Caroline passed away on Saturday, July 15, 2017. Caroline was a valued member of the Junior League of Annapolis, Inc. (JLA) since 1976 after moving to our community and transferring from the Junior Leagues of Washington, D.C. She was a continuous supporter of the JLA. She wrote the forward in our second cookbook, A Thyme to Entertain, and often participated in our fundraising and community events including Chefs by the Bay tasting event, our community political panel during the Spring of 2016, and most recently our gala last November. Caroline was a gracious entertainer and a gifted baker who knew that food brought people together in both happy and sad times. 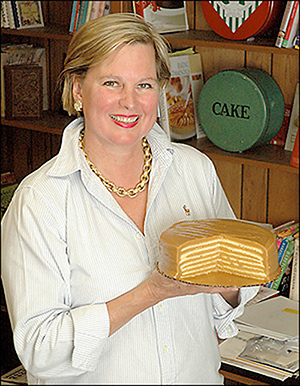 She took that passion for hospitality and founded Caroline’s Cakes. She was an example for so many of us – as she balanced a passion for her business with the kindness, generosity, and love she had for her family and friends. Her infectious smile and her ability to draw people towards her will never be forgotten. We will miss her dearly. Please keep Caroline’s family in your thoughts as they go through this difficult time. Services for Caroline will be on Saturday, July 29, 2017 at 1:00 p.m. at the Church of the Advent at 141 Advent Street, Spartanburg, SC, with a reception to follow at the Piedmont Club at 361 E Main Street, Spartanburg, SC. We have made a gift to our endowment fund in Caroline’s memory. Chick (Charles E. Reutter, III) and their sons, Charles and Richard, can be reached at: The Reutter Family c/o Mr. Richard Ragsdale Reutter, 786 Glendalyn Avenue, Spartanburg, SC 29302.